The Lemon Cake is a refreshing cake, for which you have to use cake sheets. If you haven`t done those until now, don`t worry, I have it all explained right here. This recipe it`s been in my family for years. This is a hungarian recipe, a kind of rolled cake with nuts and poppy seeds. It`s perfect for any ocasions. We usually do it for Christmas and Easter. My mother has a strange taste : she eats baigli with Easter eggs. It`s a strange combinations, but she says it tastes amazing. These ishler cookies require to make a dought, but don`t worry, it`s easy to make. The best part of these cookies is that you can make them as small or as big as you want. These are so easy to store. After the frosting is stiff, you can put them in a box, on the top of eachother. This is our version of the Australian cakes named lamingtones. I learned this a couple of days ago. The process of making this cake, is a little bit messy, but it`s worth it. 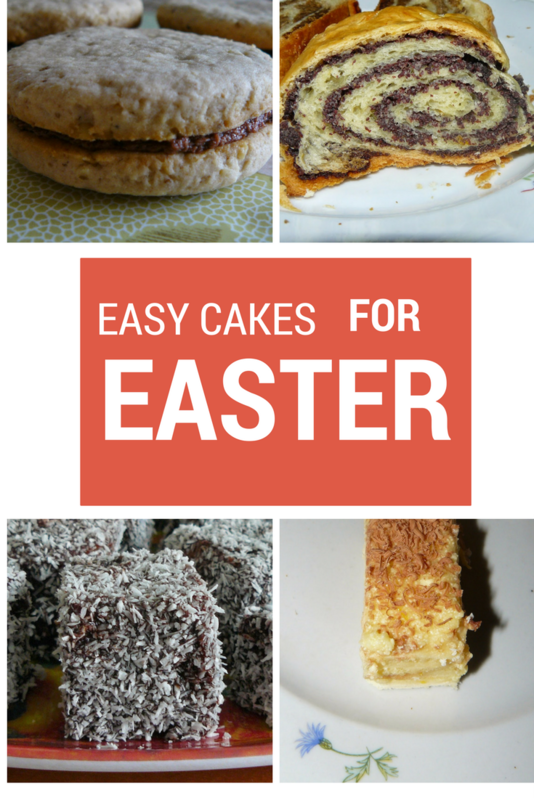 As I said, all these cakes are easy to make, and you can make them ahead with a couple of days. Join me at these amazing parties. That lemon cake looks super delicious Cristina! We are going to make greek holiday cookies and a tsoureki which is sort of a sweet bread. Lots of baking this week! I love lemon flavored anything! I'll have to try it. Pinned! :) The lemon cake is one of my favorites! Yum. I bet the lemon cake is amazing! I don't think I've heard of any of these cakes before... this is AWESOME! I am a huge fan of Lemon cake so I can't wait to make that one ! The Ishler chocolate cookies look yummy! Thank you for sharing at Ravenwould. What lovely recipes, Cris. They are perfect for Easter or any spring celebration! Thank you so much for sharing with us at Hearth and Soul. Thanks for taking the time and visit April!